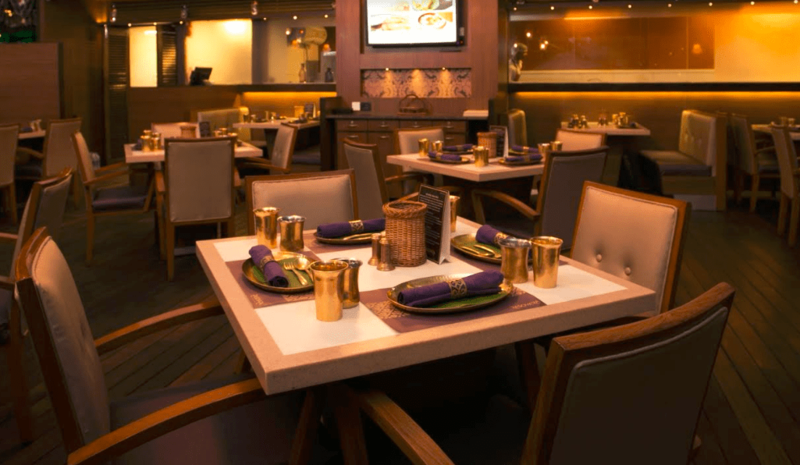 Location: Level – 2, The Collection, UB City, Vittal Mallya Road, Bangalore – 560001. Ph: 080-22133400, 080 41738968. Timings: 10:30 am to 11:00pm. Ambience: We were given a traditional welcome with a chandan tilak and a small sweet. There is an al fresco and interior seating here. The outside space has wrought iron furniture and canopies and a light post that adds a regal look. The interiors are plush with a wood tone and purple furnishings that add a luxe effect instantly. 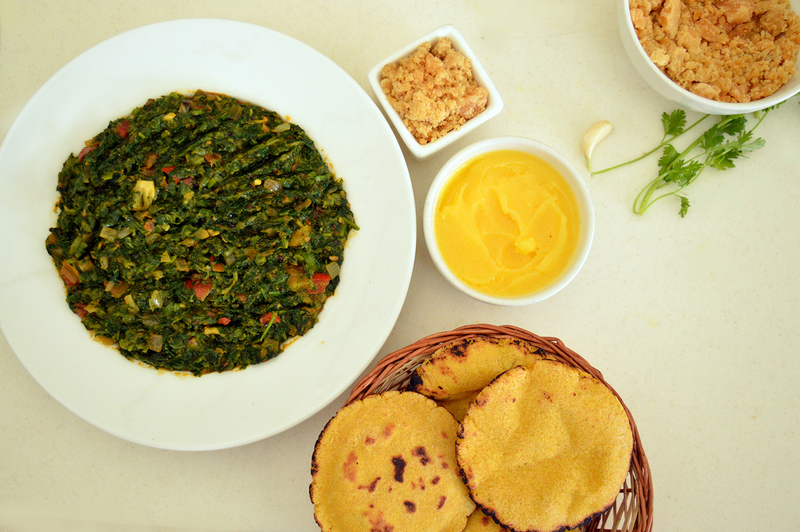 What we ate: Rasovara is known for its indulgent thaalis and we decided to sample the thaali of the day. Incidentally, there are so many combinations of this thaali that it will be at least a month before one set of dishes are repeated. The meal is extensive and includes many dishes but everything is served in small portions so you get to sample a meal that is filling yet tasty! Our meal began with the welcome drink, a tangy spicy tomato dhaniya shorba and an assortment of starters that had various tastes like sour, sweet and spicy. Served in a wooden tray with separate glass counters, we tried the Khaman Dhokla, Dry fruit Ghugra, Dudhi Muthiya, Sunehri Tikki and Tandoori Hariyali Panner. Chaats were also served – the chilli cheese sev puri and paani puri both prepared to authentic perfection. The mail course served on an elaborate thaali was accompanied by a Maharaja Lassi and started with the Rajasthani Dal Baati Churma. The crunchy baati and soft dal team well and the sweet churma and ghee make this a wholesome dish. 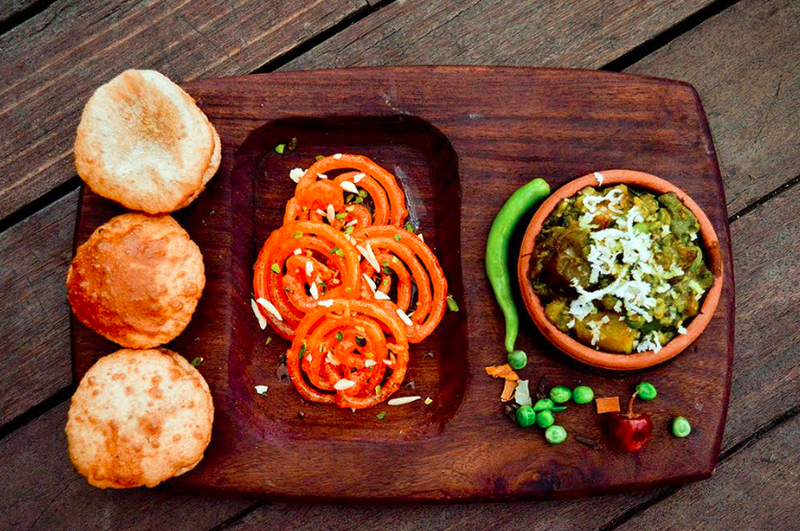 A variety of miniature Indian breads like Phulka, Puri, Baby Corn Masala Paratha and Methi Thepla are served with vegetables like Panner Tikka Masala, Aloo Angare, Kabuli Channa Panjabi and Matki Undhiyu. Each of these dishes represent flavours of the North and are spiced just right and in spite of the huge variety – the portion size is just right. You are also served a variety of dal’s and kadhi’s like the Tadka Dal, Mithi Dal, Rajasthani and Gujarati Kadhi that balance the sweet and spicy texture beautifully. Special mention must be made of the Chilman Biryani, served in a small ceramic pot for its superlative taste and correct spice levels that never over power the tastebuds. The other winner is the Khichdi for its simple flavours and a spoonful of ghee makes this a great dish. The meal ends again with a tray of desserts – Fruit Custard, Moong Dal Halwa, Rose Cham Cham, kesar Wati and Malpua with Rabdi. My favourite though was the Moong Dal Halwa, made fresh and hot with the right level of sweetness and ghee (yes again) that makes it melt in your mouth. In all this is a royal meal in the true sense of the word and if you want to taste good Indian food this is your one stop destination. Boil enough water in a deep non-stick pan, add the mustard leaves cook on a high flame for 4 to 5 minutes, while stirring occasionally. Strain using a strainer and drain well. Refresh it in enough cold water immediately and drain well again. Keep aside for 2 to 3 minutes to cool slightly. Blend in a mixer to a coarse mixture using ½ cup of water. Keep aside. Heat the oil in a non-stick kadhai and add the cumin seeds. When the seeds crackle, add the garlic paste, ginger paste and asafoetida and sauté on a medium flame for 30 seconds. Add chopped onions, green chillies and sauté. Add the Makai atta and stir continuously till the oil gets completely absorbed. Add the mustard leaves, turmeric powder, salt, mix well and cook on a medium flame for 2 to 3 minutes. Drizzle ghee and serve hot. Best accompanied with makai rotla. 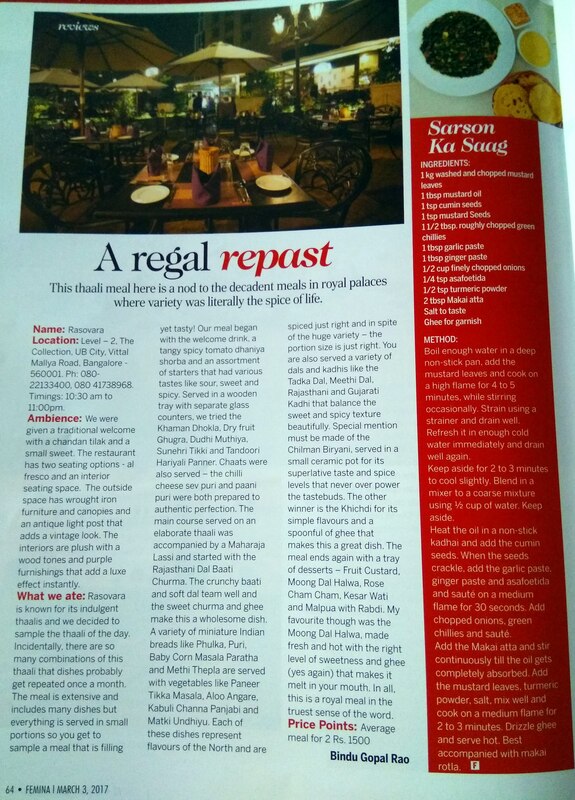 This story appeared in the Mar 3, 2017 issue of Femina.